Chrysler is reviving its classic Super Bee and Yellow Jacket monickers at next week's LA Auto Show. 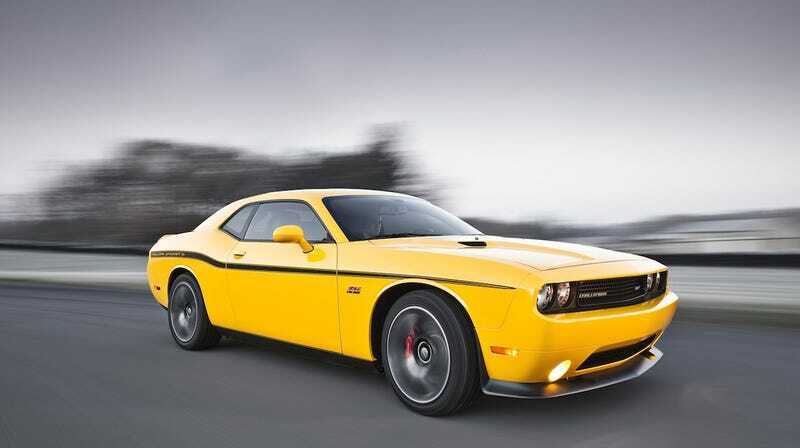 Based on the Charger SRT8 and Challenger SRT8 respectively, both cars get a fresh coat of "P***y Magnet" yellow paint, and a slew of badges and similarly-colored interior bits n' pieces. Sadly, there's no modifications being given to the 470 HP, 470 Lb-Ft, 6.4-liter HEMI V8s or the Challenger/Charger platform. So, what you're really paying for here is a chance to drive around in a car that screams "I live in a trailer park!" outside and in. The you-can't-ever-have-too-much-yellow theme continues inside both cars with dash plaques that reapeat the Super Bee and Yellow Jacket logos. You know, in case your bro-hams forget you're the kind of guy who pays extra for paint and badges.